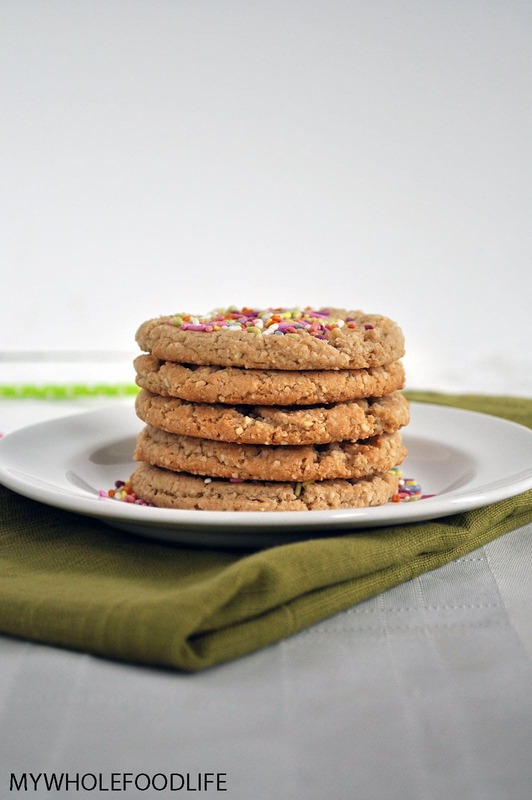 I am super excited to share these Grain Free Sugar Cookies with you! These came out so delicious and they have the texture of real cookies without all the unhealthy ingredients! These cookies are paleo approved, vegan and gluten free. If you love to bake during the holiday season, you may want to check out this post as well. These cookies are hard on the outside and chewy in the middle. Perfect in my opinion. 🙂 I was going to frost them, but I realized I was out of coconut butter to make my 5 minute frosting recipe. So I just topped them with some natural sprinkles instead. I made my cookies kinda big, so I only got 12 in the batch. If you make them smaller, you should be able to double that. A grain free option for sugar cookies! In a medium sized bowl , add the dry ingredients. Gently mix with a fork. In a mixer , add the coconut butter and maple syrup. Cream together. Be careful not to over-mix or the cookies will spread too much. Add the sprinkles now if you choose to use them. Use a cookie scoop to drop cookies onto a lined baking sheet . Make sure to space them at least an inch and a half apart because the cookies will spread. Use your palm to flatten each cookie. Once all the cookies are on the baking sheet, place it into the fridge for 20 minutes to chill. Bake cookies for 10-13 minutes. Let completely cool before removing from the baking sheet. About 25 minutes or so. If you handle the cookies too early, they will fall apart. These cookies should keep in the fridge for at least a couple weeks. They can also be frozen. Enjoy! I make a no-bake cookie with the same ingredients. Didn't think about baking it to achieve that classic cookie texture. Trying these soon! Thanks!!! These look perfect! Sugar cookies were always my favorite - I seem to like simple flavors best. Love this healthier version! I'm relatively new to the whole foods baking game. My daughter is allergic to almonds and wheat. Is there another flour that would be an acceptable substitute? Thanks in advance! You can use a gluten free all purpose blend, or oat flour. Thank you! I wasn't sure if the oat flour changes the texture/flavor too much. Melissa, I just want to thank you. You make my holidays bright with all your great recipes I get to enjoy with my family. God bless you and your family during this holiday season and throughout this whole year. I can't see the picture. Maybe you over-mixed? That can sometimes mess up the result. :( Sorry that happened. I have almond meal instead of almond flour - will that still work? Or maybe that's what others who have had trouble used as well? I actually didn't realize there was a difference until recently. I think those that have had trouble over-mixed. Almond meal may also produce a slightly different texture/taste. If you try it, I would love to know the results. When you say a lined baking sheet, what exactly do you mean? Should I line it with foil, non-stick foil, or parchment paper? My family loves these cookies! I will say that I tried them with real butter and while they were oh so tasty they spread paper thin and ran off the side of my cookie sheet. I have a double batch chilling in the fridge this time with homemade coconut butter. :) Thanks for all of your hard work to bring us these tested and delicious recipes! I would have been so lost without your site when we had to change our eating habits a few years ago. Still my favorite site! I should add that before the real butter incident, I made this a couple of times with coconut butter and they were in perfect form when they came out.